Pupils at Darley Dale Primary School have planted a new woodland in their school grounds, creating a long-lasting, wildlife-friendly outdoor learning environment. 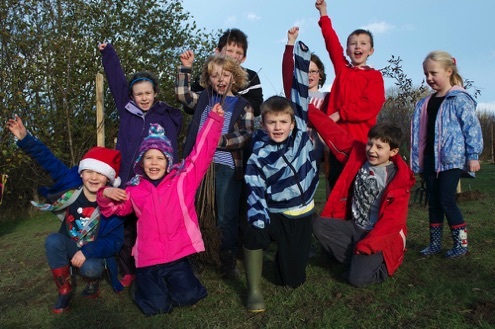 Richard and Penny Bunting, from local environmental project Little Green Space, joined pupils, staff, parents and governors before Christmas to plant 140 native trees, including oak, rowan and hawthorn. “As a Forest School, we know that access to green spaces and outdoor learning is hugely beneficial for children, and these trees will benefit our current pupils and future generations of schoolchildren,” said Margaret Bax, Governor at Darley Dale Primary School. The new woodland was funded through a grant from The Tree Council, and the trees were supplied by Tansley-based Derwent Treescapes and conservation charity The Woodland Trust. Help and advice was provided by Derbyshire County Council Countryside Service's Stephanie Burkinshaw, Derwent Treescapes and Little Green Space. “Trees are terrific for wildlife – they create food and habitats for thousands of species. The pupils at Darley Dale Primary School have created a lasting legacy that could continue to support wildlife and benefit people for hundreds of years,” said Richard Bunting from Little Green Space.